We had the pleasure of receiving a new Duncan Jones picture book in the mail. Years ago, we were privy to his first book. My kiddo attended a book signing of his at Half Price Books in Humble. She has been wearing t-shirts he designed ever since. Needless to say, she was pretty thrilled to discover he had sent her a NEW book. I think it’s a silly a book because every single animal wants to be the color that they already are. The flamingo wants to be pink and the flamingo IS pink. All rhinos are gray, people know that. The green snake already is a green snake. The wildebeest wants to be brown like the ground and he already is brown like the ground. The zebra just can’t decide and I’m kinda glad he can’t decide, because if he chose the color that he already was, he’d be as crazy as the others. I don’t know why the others want to be the color they already are. I think it’s a pretty silly book, but I like it. And thank you for writing it. This picture is from BookMine – the one I took at GBITW didn’t take. I’ve been eying this for awhile now. It’s been perched on display in the kid’s section at Good Books in the Woods for months now. Why has no one picked it up? Why is no one buying this. It’s in a nice slip cover, it’s been taken care of. There’s some slight water damage that – as a book collector – I see no problem with, it’s ever so slight and does not take away from the magic of the book. It’s a nice, clean copy. It’s only $12. I know why I haven’t purchased it – I’m completely overloaded with books AND have NO money. But that doesn’t mean I’m not going to read it until someone else does decide to take this treasure home. So today, I sat down with the kiddo, in a bookstore, in another person’s home – and my home away from home – and read her the first story in the book. 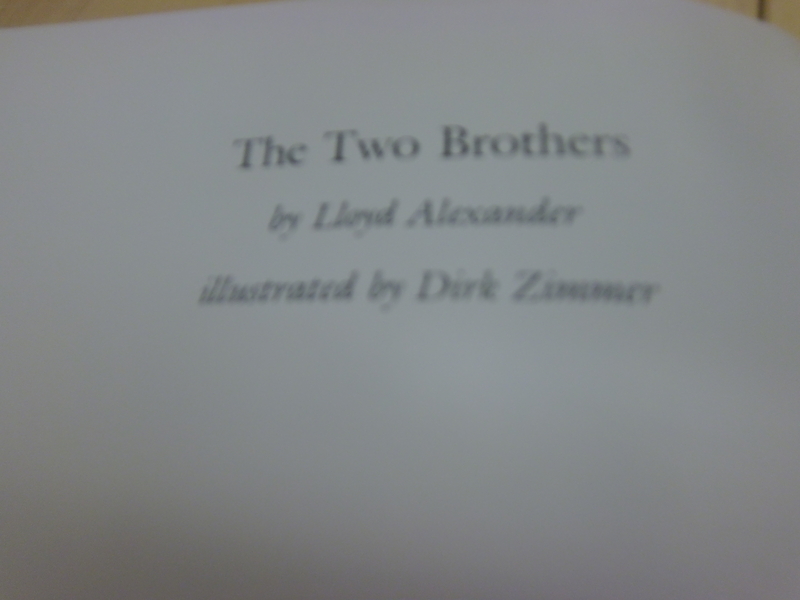 Filled with castles and kings as any good Lloyd Alexander story should be, The Two Brothers follows a tale of two men who split the kingdom their father left them in half. From the rubble of the fortress they grew up in, they build two separate castles. What begins as a sweet story between the kindest brothers ever evolves into a competition of who can build the better kingdom, each man filled with greed and a medieval ‘keeping up with the Jonses’ mentality. This story was kiddo approved (she’s three, but it is a nice tale for any age). 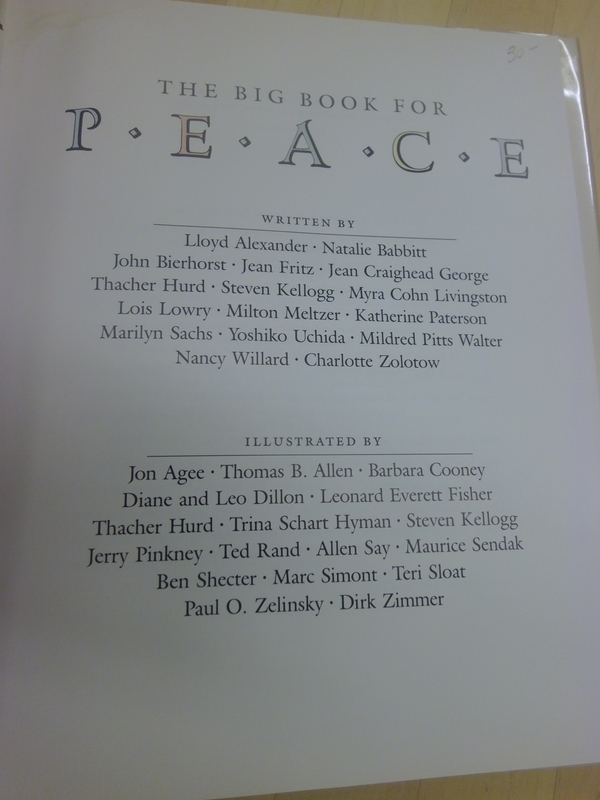 I look forward to the next chapter of The Big Book of Peace. I think everyone who has talked to me for longer than a minute and a half about children’s books knows how much I adore Brian P. Cleary and his books on grammar and math, but I have yet to thoroughly discuss other educational picture books. Mainly, because even though I collect them, kiddo hasn’t quite grown up enough for us to attempt them with purpose. Today, however, we took the bull by the horns and branched out. So a two year old who still stumbles through her ABC song, can only manage some really intense stripes when writing, and can only identify circles and triangles isn’t really ready for a book about circumferences, diameters, the concept of a radius, parallelograms, diamonds, and all that, but that’s when it is perfect to start reading these stories. By the time she needs the information, I want the stories thoroughly engrained in her mind. Sir Cumference is a knight, married to Lady Di of Ameter, father of a short-stack son named Radius. With their help, King Arthur is able to come up with a plan to keep his knights on their best behavior as they discuss the well-being of Camelot. Add to the cast of characters a carpenter named Geo of Metry, the books instill all the basic concepts of geometry in the disguise of some exciting fake King Arthur folklore. Start reading the books to your kid from birth through early elementary school and you’ve got one math savvy child without even trying. As a home school mom with a serious distaste for math, I want my kid to enjoy it and make her life a lot easier than mine was by the time her high school curriculum comes along. For slightly older kids, I’d say ages 5-10, the book easily lends itself to hands on activities. Paper projects, baking projects, even wood working if you were bold and wanted to make an actual play table, the story takes you step by step through cutting a rectangle down into all the various shapes. And, of course, it’s a series. Click the Sir Cumference link to purchase from Amazon. Click the collection image to go to another blogger’s reviews. Story time, typically Wednesdays at 10:30 am, was stretched out over the course of 2 hours today (9 am – 11 am) in honor of one of the biggest costume days of the year. Good thing too, because our most interested little patrons came in early. Equipped with a candy bowl, coloring sheets, crayons, and a few costumed employees who were more than happy to pose for the camera in their book-themed attire, story time commenced bright and early. There are many versions of Snow White , the original story was included in the Brother’s Grimm collection of fairy tales and horrors. 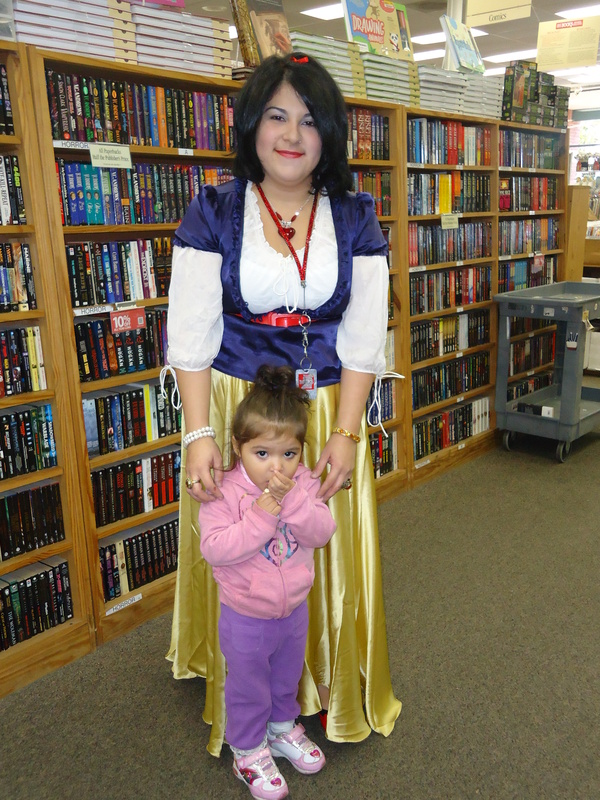 Half Price Books Employee Stephanie is wearing the most well-known Snow White costume made famous by Disney. 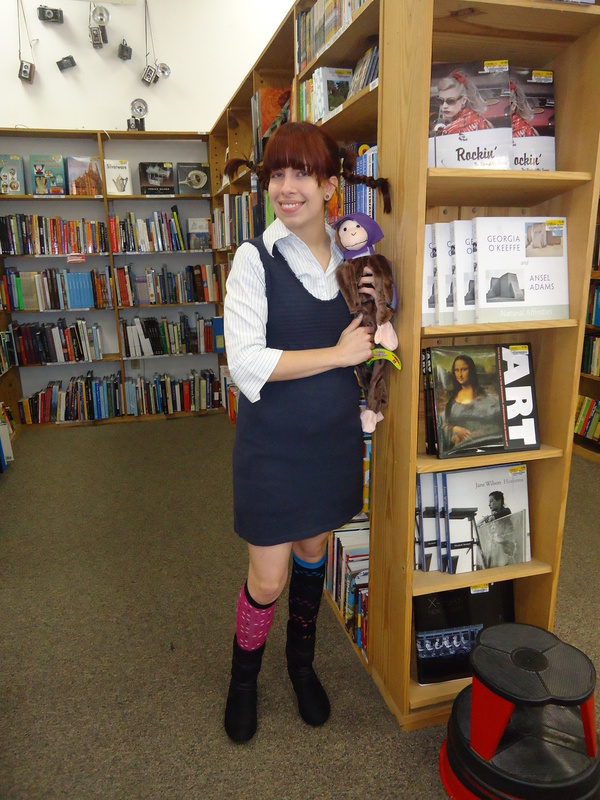 Another bookseller, Veronica, promoted Astrid Lindgren’s young adult character Pippi Longstockings . Some forget that Pippi Longstockings was many things, a monkey toting pirate among them. Veronica didn’t forget! These monkeys are available at most Half Price Books stores and can usually be found near the registers. They make LOTS of noise and are designed to sling shot across the room. If you are in the area and missed this bit of fun, be sure to check out Baldwin Boettcher’s Halloween Event this evening at 6:30 pm. Baldwin Boettcher is the public library inside the gates of the Mercer Arboretum off Aldine Westfield. It’s a hidden treasure of a library that often gets passed on the way to the botanical gardens with little thought to the fun things that may be happening indoors. And remember: It is never too late to celebrate your love for a fantastic book character. If you missed this morning’s story time, and already have plans this evening, here are the books we enjoyed this morning. Maybe you can find copies and read them with your kiddo in the days to come as you sort out their candy haul. 1. A Pop-Up Trick or Treat book called Halloween Bugs . 2. A Pull and Poke book called Pat the Beastie . 3. And my favorite, a Halloween Adventure called One Spooky Night . This title was actually added to the previous Low Down on Kid’s Books post in an edit before I decided to make this a weekly ritual, but it belongs in this grouping. Ayla wasn’t sure about sitting through the first page, but by the second she was hooked. The first time we read this she made me read it three times in a row and carried it around the house for an hour after that. The illustrations are fun and she loved being introduced to new animals she hadn’t seen before: wombat, emu, and koala. Plus, the story is super cute too. So I totally thought this rocked, despite the page dedicated to penguins pooping. But I love penguins. Ayla, on the other hand was not so interested. It didn’t matter how cool or cute the penguins were being, she was 100% focused on Where to, Little Wombat by Charles Fuge. Therefore, no matter how cool I thought it was, I can’t give it higher than a 3 out of 5 stars because kids books really should *mostly* be for the kids. Oddly spiritual in a creepy way for a kid’s book. Didn’t care for it. We had originally picked it up thinking the title would be fun for her because its got her daddy’s name in it, but you can’t judge a book solely on its title. 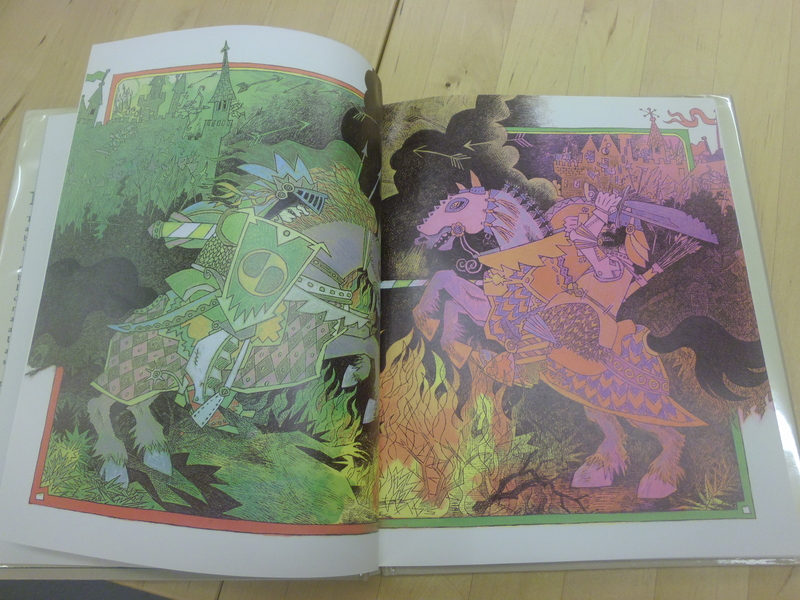 The illustrations are beautiful though. Could be useful for teaching personification to a small child. “A phantasmagorical flight of fantasy at your fingertips…” is no misconception! We adore this one at our house. The writing is reminiscent of Dr. Seuss, if Seuss were more soothing and less rambunctious. The illustrations are worthy of being compared to Bryan Collins (of bacstudio.com) and if you follow me on anything, you know how much I love his work. The Tickle Tree should be part of every child’s bookcase, and maybe a few adults’ as well if you are a collector of poetry and art. Click on the titles to see the books on Amazon.com.